Stockmann has over 1,2 million loyal customers in Finland and reaches over 10 million gross contacts monthly with its owned media channels. Stockmann can offer presence through digital media (newsletter, website, social media), traditional media (print magazines and direct mailings) and in-store (windows, atrium/facade banners, video walls and events). 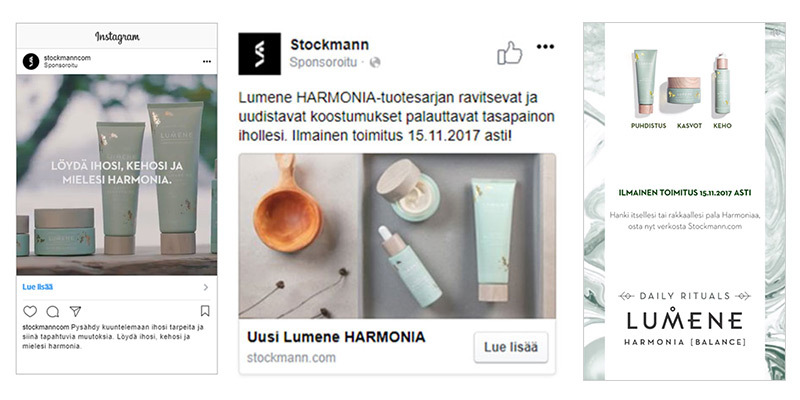 The owned media channels provide a targeted approach to a unique demographic of Stockmann’s customers – the most desirable customers in Finland. Stockmann can offer presence through digital media channels (website, newsletter, social media and application). Stockmann digital media reach is millions monthly. The focus of the traditional print media is the new Stockmann Magazine. Magazine will be published three times in the year 2018: March, September and November (Christmas). Also traditional direct mailing, leaflets, tabloids etc. can be executed by demand to targeted audience. In-store medias are the face of Stockmann. Our Windows reach 2 million and Video walls 700 000 contacts weekly. We are constantly developing new store medias to help you reach your customers near and inside the store. Stockmann media is available for Stockmann’s suppliers, tenants and loyalty program partners. Stockmann reserves the right to choose all published content in Stockmann Media. Stockmann mediabook includes media specifications, prices and material specifications. What it does: The magazine is an edit of the modern, urban lifestyle for the Stockmann customer, providing endless reasons to visit online and in-store. Content: All categories of fashion, beauty, home and sports will be featured alongside lifestyle content for topics such as tech and travel, encouraging the customer to browse seamlessly from one department to another, in one inspirational magazine. The magazine provides richness to Stockmann’s brand identity, portraying the brand as the ultimate style destination. The magazine will be available in Finnish and Swedish. The magazine is delivered to First Loyal Customers and shared in Stockmann department stores and airports in Finland. The magazine will be published in March, September and November (Christmas issue). For all advertising requests and specific publishing dates and material requirements please contact Stockmannmedia@stockmann.com. 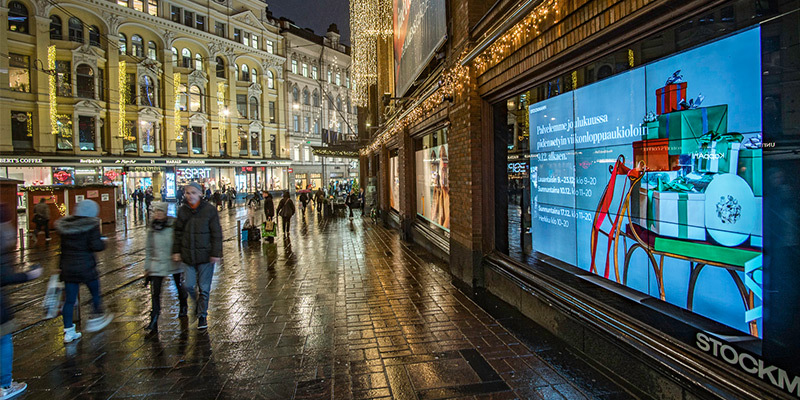 Windows are available as ad space for selected partners that support Stockmann brand. Stockmann reserves the right to accept or decline window advertisers depending on window plans. Pricing (24 % VAT will be added), prices indicated per window. Please note that assembly and disassembly time is included in the media time. Production, assembly and disassembly are not included in the media price. The deadline for the window plan is two months before the publish day. Stockmann department store chain has all together 6 department stores in all the biggest cities of Finland. Video Walls are located in most visible places on the main streets of the cities offering reach of approximately 700 000 weekly passers. Stockmann’s department store in the city centre of Helsinki is a landmark in its own right. There are daily 36 000 passers at the Mannerheimintie and Aleksanterinkatu video walls, which gives you over a million possible viewers per month. Video walls are an excellent opportunity to show your brand videos or advertisements in at the most central locations in Helsinki. The material plays repeatedly day and night, showing relevant Stockmann’s campaigns and supplier’s advertisements, loops approximately 10 000 times/ month. Maximum length for video is about 30 seconds. Size 1920 x 1080 px. Please note that the video texts are bilingual and required in Finnish and Swedish. The text can also be only in English. Video is silent. The deadline for the materials is 14 days before the publish day. 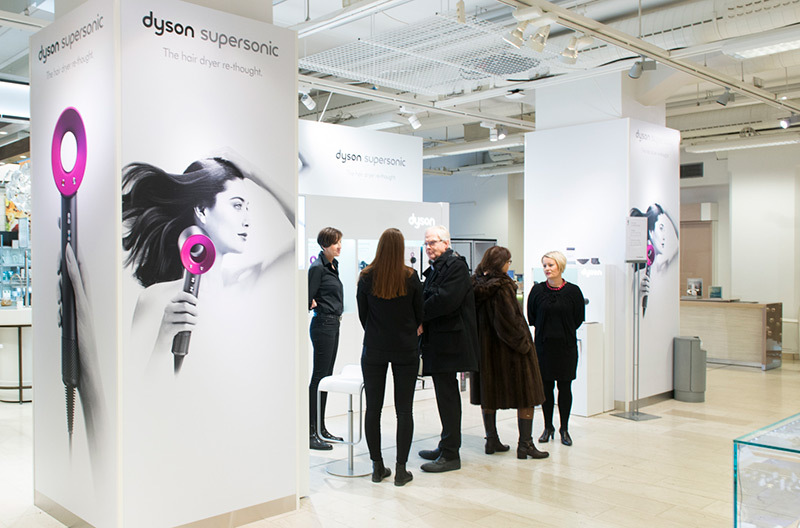 Digipylons are a real point of sale media – this is how you reach your customers when they are actually shopping! 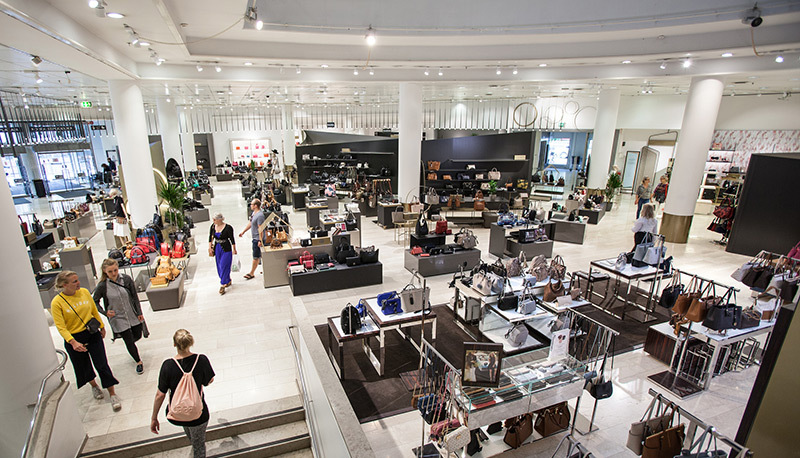 Stockmann has annually millions of persons walking through the department store. Audio marketing within store catches the in-store customer and will both inspire her and help her in the decision-making process. Audio marketing can be played with different frequencies, during different weekdays and specified timing. Voice production and project management is included in the price. Ad text must be provided by advertiser in Finnish. Media prices apply for one produced audio advertisement. Additional versions will be charged 50 € / version. In general, the speaker is a gentleman, trained artist who can vividly speak the advertisment. Texts are needed in Finnish and the translation to Swedish is included in the media price. In audio the message needs to be very short. If there are foreign or new words in the advertisment, a pronunciation scheme can be added. You can give styleguidelines to the advertisment as also desire music to the background. Inquiries for Pop-up spaces; please contact stockmannmedia@stockmann.com or your buying contact. Stockmann Media can offer its partners great possibilities for different kind of happenings from PR and sales promotion to bigger events. All events need to be related to Stockmann marketing plan and commercial calendar. Inquiries for Event spaces; please contact stockmannmedia@stockmann.com or your buying contact. Local store possibilities for atrium / facade banners: please contact stockmannmedia@stockmann.com. Note: Banner production is to be ordered from a named subcontractor to ensure the right fixtures and quality. Production price for the banner is 3 750 € + VAT . Production costs are to be agreed and billed via our subcontractor. Advertiser is responsible for the production costs. The deadline for the visual plan is 21 days before the publish day. Stockmann.com has a million sessions and hundreds of thousands of unique visitors monthly. All partners and brands must sell merchandise at Stockmann.com. Please find detailed info from the powerpoint presentation. Advertorial article with possibility to shop products directly. Advertorial article will be automatically shown also in Stockmann Application. For the text we’ll need a title, a short ingress and a main text, which can be divided into smaller parts (those needs subheading). The text should inspire customers by presenting the brand’s product range and story. The purpose is to create an image and attract to buy its products. The amount of text will be maximum A4. In addition, it have to contain the most relevant keywords/tags, a short description social media and your desired layout. All texts have to be in Finnish. The main image’s size is 1440 x 653 px. This image will be cropped in mobile view so it should be centered, for example, with a possible logo in the center. In the illustration an image’s width is 803 px. Height can be adjusted. A good size is e.g. 803 x 536 px. An image of that size can contain a multi-image collage by leaving white in the background like in the examples. The small product images should take as few kilobytes as possible without its quality suffering too much. This is rather situational as the images can be very different. But as said, this varies case-by-case. 200 kB is the absolute maximum limit. JPG should be preferred over PNG. The Stockmann’s editor has the right to edit the material therefore the original high-res images should be included in the supplied material. 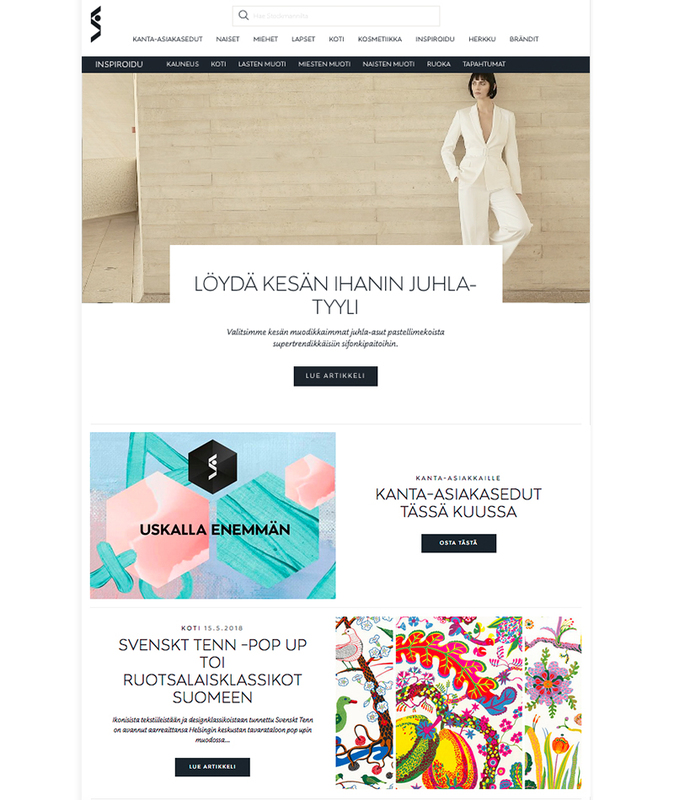 Stockmann Newsletter is one of the main communication channels with several messages per week. The subscriber list includes both regular and loyalty program customers. All newsletters are targeted to specific audiences in order to ensure valuable content to our customers. Newsletter marketing consist of brand dedicated letters and banners in suitably themed letters. Brand dedicated letters contain only a specific brand’s material while newsletter banners are combined with other content of similar themes. Advertiser can book a publishing week and Stockmann reserves the right to decide the actual publishing date to fit the newsletter banner to Stockmann marketing plan. The deadline for the visual plan is 14 days before the publish day. 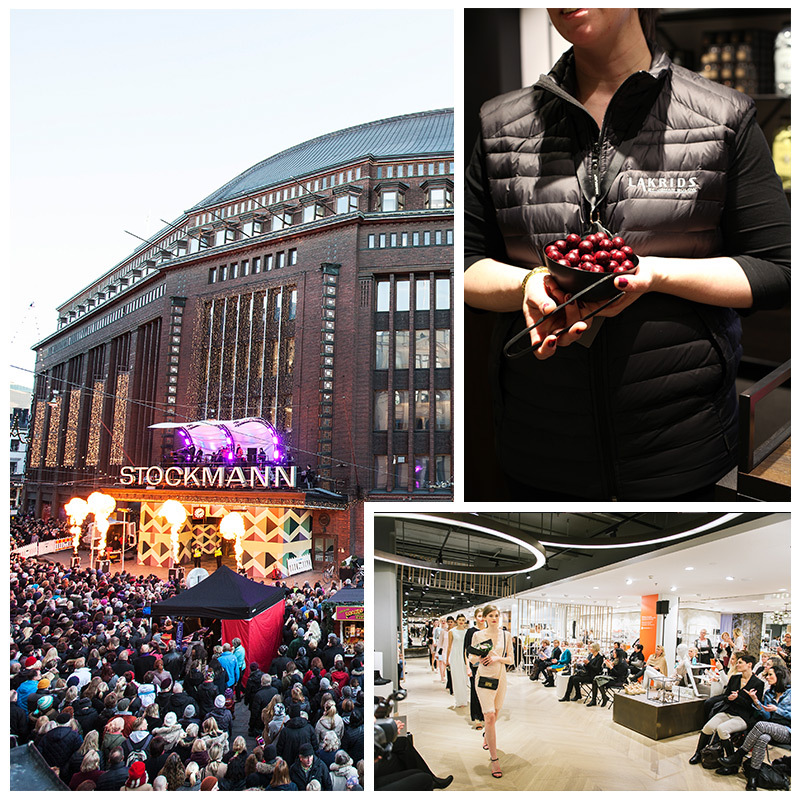 Stockmann currently has over 130 000 fans on Facebook and 30 000 followers on Instagram. All social media campaigns are tailored according to brand goals. We set a goal for the campaign together with the brand and after that, determine the ideal target groups, channels, creatives, purchasing methods and metrics for the campaign. The main channels for social campaigns are Facebook and Instagram, but also Twitter and Snapchat are available (if considered suitable for the campaign). Stockmann media is available for Stockmann’s suppliers, tenants and loyalty program partners. 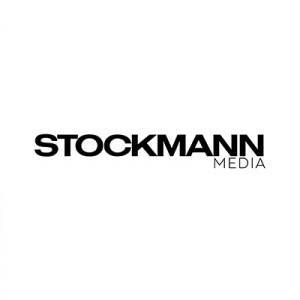 Stockmann reserves the right to choose all published content in Stockmann Media. Cancellations must be made in written form to stockmannmedia@stockmann.com. For cancellations made less than 14 days before the material deadline will be charged 50% of the agreed price. All media prices VAT 0 %.